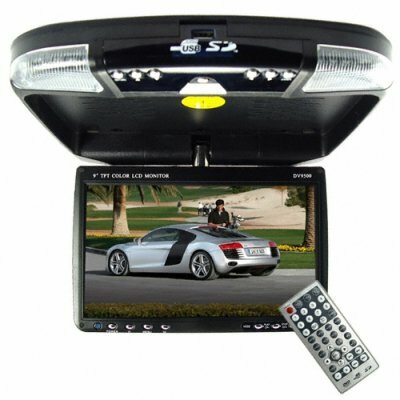 Successfully Added Car Roof Mounted Multimedia DVD System with 9 Inch LCD Monitor to your Shopping Cart. Car roof mounted multimedia DVD system with 9 inch LCD monitor. This roof-mounted vehicle audio and video system features a high quality DVD player with 9" LCD screen (16:9 widescreen aspect ratio), enhanced by excellent compatibility with a broad range of digital formats (movies, music and images). Simple to install, this feature-rich system has built-in stereo speakers and a user-friendly button navigation and on-screen menu system or remote controller for your passengers convenience. And that's not all! With a swivelable 9 inch screen, incorporating full left-right 360 degree screen rotation and up- down 105 degree flipping, this fantastic multimedia system is viewable from any passenger seat inside your vehicle. Play movies, listen music, or watch an AV IN feed - the choice is yours! With its robust design and stylish looks, this system is an cost-effective multi-media upgrade solution to any vehicle (SUV, Van, RV), ensuring that even the longest journey is an enjoyable and pleasant experience. A great wholesale price makes this car DVD + multimedia player perfect either for the re-sale market, OEM market, or company/personal use. As always, it is available direct to you from the original source for wholesale direct from China electronic products, Chinavasion. ¡¡¡k arte tieene¡¡ muy contento con el producto y con el servicio. Facil instalacion. estoy muy contento con la compra en ChinaVasion.el reproductor funciona bien y la atencion y seguimiento del envio ha sido excelente. Very happy with it, easy to install. Good picture.